Designed for precision and assembly work, the Ejendals Tegera 931 Assembly Gloves are made from soft and flexible nylon, and feature a PVC-dotted palm for improved grip and excellent fingertip sensitivity. They are supplied in a white design and suitable for various applications in dry and clean environments. 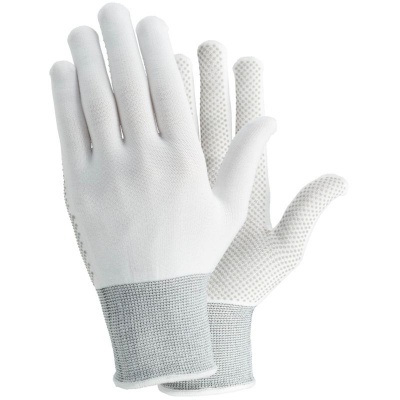 The 931 Assembly Gloves are designated Category II gloves, meaning that they should be suitable for most medium-weight tasks. Gloves in this category are suitable for instances when the risk is neither minimal nor irreversible. The Tegera 931 Assembly Gloves are available in six sizes that should suit the hands of most users. Please measure the circumference of your hand around the knuckles (excluding the thumb) with your hand open and your fingers together, and the length of your hand from the tip of your middle finger to your wrist.